Those that know me, or follow me on Instagram, will know that I am obsessed with all things nails. The thing is I hardly ever create blog posts about my manicure efforts, eventhough there is barely a day that goes by without me painting my nails (and half my fingers in the process) or popping on some fabulous falsies. 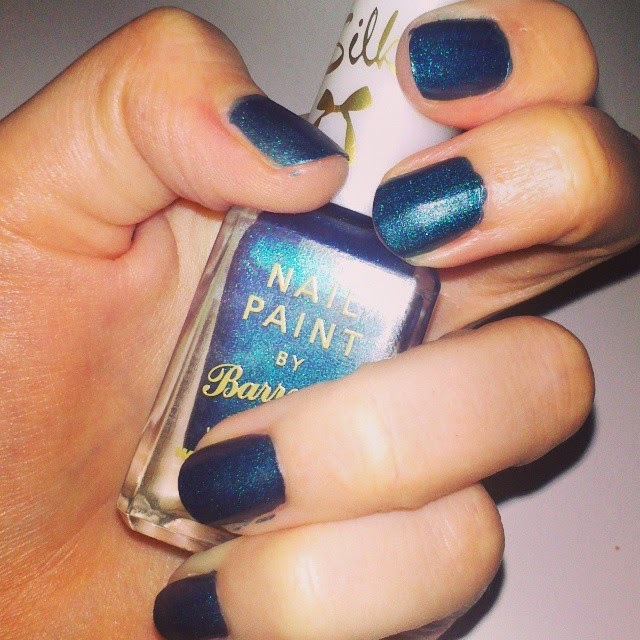 Well, when I picked up this Barry M Silk Polish in Forest, I knew it was blog worthy, as it is bloody beautiful. It applies super smoothly, as you would expect from any Barry M polish and just two thin coats is enough to give a saturated coverage. It dries to a beautiful semi-matte finish, almost like a candy shell, it is just lovely and feels so nice on the nails. Forest is ther prefect shade for the festive party season with it's deep green metallic shade and subtle glitter flecks that sparkle when they catch the light. I wore the polish like this for a few days, but then the polish started to chip on the ends after washing a mountain of dishes. But I wasn't ready to say goodbye to forest. 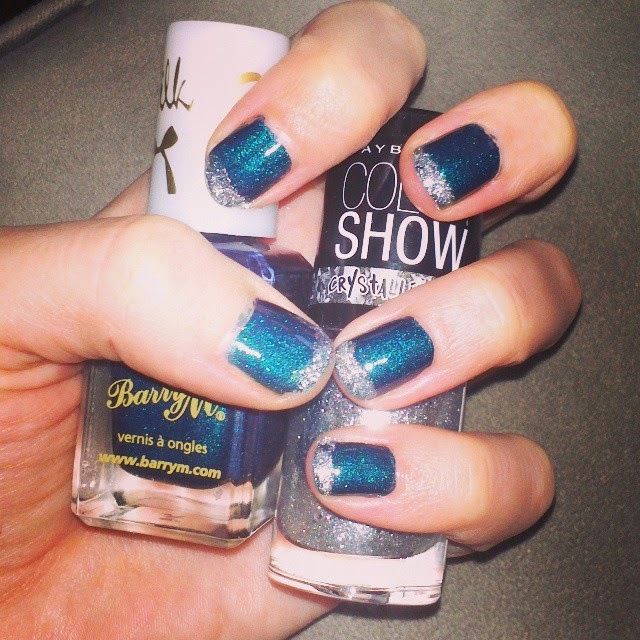 So I covered the chips with some silver from Maybelline Color Show and a top coat and the result was dazzling. 1) Silk Effects in Meadow. 2) Chameleon Effect in Blue. 4) Nail Paint in Silvery Lilac. 5) Nail Paint in Racing Green. 6) Nail Paint in Raspberry. 7) Nail Paint in Gold Mine. I hope you liked my first Manicure Monday, there will be plenty more to come as I bought myself a Ciate advent calender from TK Maxx for the bargain prince of £19.99 - it feels like December will never get here. It appears to have sold out online, but if you are lucky you might be able to nab one in store. Any wintery nail shades you would reccommend? That's such a wonderful shade of deep blue. I love this dreamy colour! I have lots of the pastel ones in the range but nothing this AW/Christmassy! Really am liking this match reminds me of The Frozen hype! Love that colour, I'm now lusting after it for my toe nails - which are true only ones I paint.